Apr 15 Iulius E. S.
There are some good scenes, but the storytelling is far too confused to make this flick actually good. If it suffers with anything it’s an occasionally cumbersome screenplay that is nowhere near as slick as McQueens direction. Although I felt the whole film could have been simplified and peeled back a touch, I did nonetheless really enjoy this and felt the whole cast really stepped up. Very solid. Exists in that "liked, but didn't love" zone. What do you say about this type of film? Well, if you're me, you leave it at that and hope no one starts a conversation. Davis stars as a well off black woman whose troubles begin when her white husband dies. People die, allies act childishly, characters take themselves way too seriously, all in How to Get Away with Money. 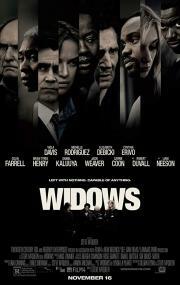 Widows is a well shot dreary affair, which compresses a heist, a political rivalry, gang violence, race relations, and grief into a 2 hr film. The acting is good, very sombre though Debicki does get the one fun moment. Ultimately I found the characters are unlikable, and didn’t enjoy the film. OCEANS 11 taken deadly seriously and treated as a wonderfully old-fashioned crime drama - might be the fact that this sort of film is like an oasis in the desert nowadays, but McQueen & Flynn's deft and economically plotted screenplay, combined with a crackerjack cast (Davis and a wonderfully sinister Kaluuya are standouts) make this terrific, thoughtful entertainment, that jacks up the tension extraordinarily by the climax as all the threads tighten and come together. You could do better, McQueen. Much better. Elizabeth Debicki stole the movie. The rest of the cast didn't bring much to the table, to be honest. How Debicki didn't earn a nomination is beyond me. Less of a heist film and more of an exploration of power struggles among the haves and the have nots. Every character is at their worst in a effort to help themselves, and it is the dialogue between these characters that is the thrilling aspect of the film. McQueen brings his trademark visual flourishes and the cast is absolutely fantastic in a story that I only wish went a little more genre. 20 bonus points for McQueen letting Debicki be six-foot-whatever. It’s overplotted with like fifty goddamn characters and a dozen subplots to keep track of in one two-hour movie (and I could definitely lose the dead son backstory, which feels more shoehorned in for political agendas than character), but the grim, dense, violent and interconnected tapestry of crime and corruption and politics it weaves definitely appealed to me. Had kinda a 70s thriller-ish vibe to it in some of its best scenes, and very creative filmmaking flourishes aplenty. Performances were generally good, but the plot is a failure. The details of the story were impossible to enjoy. The side stories were equally unconvincing. Liam Neeson was wasted, as were Colin Farrell and Robert Duvall. Elizabeth Debicki was hot. I liked most of the moment by moment, except for the confusing, and poorly edited, flashback scenes. Worth watching if you don't think about it too much. I just can’t make heads or tails of the Bad Moms franchise. If this movie had a different cast, I probably wouldn't like it as much. I thought all of the acting was pretty great, with Davis and Debicki standing out with some sensational performances. Al in all, I really enjoyed this film, and would recommend to anyone who enjoys heist movies. If you watch this expecting an Ocean's-style heist movie, you're in for a surprise. Yes, there is a star-studded cast, many memorable characters, well-staged action moments and also some surprising twists. Yet McQueen and Flynn seem almost determined to take the fun and glamour out of the genre wherever possible: the violence is shocking and feels real, motivations are darker and more selfish than you'd expect, and reluctant team-ups don't necessarily end with everybody becoming besties. Quite good but there are quite a few holes in the plot that are just too big to overlook. Also, I kinda expect a bit more pressure on protagonists (except the lead) since there weren't many stakes. It didn't feel like they had anything more to lose. Davis, Debicki and Farrel are great but others not so much. The DCEU gritty reboot of Ocean's 8. Despite being incredibly well made, from the direction to the action, it's let down somewhat by its pulpy plot trappings. 3 saatlik yönetmen kurgusu gelecek mi acaba? mevcut haliyle janr üzerindeki denemeleri ve bozmaları belki daha iyi gösteriyor ama yeterince pişirilmemiş, altı dolmayan imajlarla bunu yapıyor olması biraz problemli gözüküyor. buradaki problem elbette filmin sığ kalan derinliği kadar janranın geri kalmış ama bol bulunan örneklerinin dayatmalarından kaynaklanıyor fakat mcqueen gibi bir yönetmen, böyle bir kadroyla bunu çok daha rahat aşabilirdi.